It is appropriate that we flash forward to three months from now since it has been about three months since the last new Agents of SHIELD. In the future, we are in space and we see a space ship that looks abandoned except we see an astronaut with a SHIELD logo on its sleeve. Back in the present day, we are in Bogota, Colombia where an unseen force steals guns from a police convoy. We see a young religious woman is the one behind stealing the guns. Joey and Daisy arrive to investigate and speak to the police chief to give him the low down as to who might be involved without giving too much away about who they truly are. Hunter, Bobbi and Mack there too. Mack finds some metallic tracings on the ground but FitzSimmons says they cannot get anything conclusive from his findings. However, as Mack explores the area further, he sees the metallic tracings on the shoes of the same woman we say taking the guns. The woman uses her powers to knock Mack out and kidnap him. Mack wakes up in her bathroom and see the woman talk to a young man. Mack manages to get loose but the woman uses her powers to re-capture him. The woman proclaims not to speak English while Mack only has high school Spanish yet the two manage to communicate enough for Mack to learn how she got her powers and how she believes it is a gift from God. Bobbi takes a look at security footage that shows Mack being taken so she, Hunter and Daisy goes to the woman’s apartment and manages to capture her. On the Bus and in a container fitted to hold her, we learn her name is Elena Rodrigues while the young man is her cousin. Elena isn’t happy at being taken so Joey is tasked to speak to her and gain her trust as he speaks Spanish. We learn that Elean took the guns to keep it out of the hands of corrupts cops. Bobbi and Hunter go to a bridge and see Elena’s cousin dumping the guns. As the two arrest him, the corrupt police chief and his Inhuman deputy uses his powers to knock out Bobbi, Hunter and the cousin. The police chief then kills the cousin to send a message. When Bobbi and Hunter wake up, the Inhuman cop, uses his paralyzing powers to knock Hunter out again so the chief can use him as leverage to get Bobbi to talk. Back on the Bus, Mack relates to Elena because of their faith and she decides to join the team to rescue Bobbi and Hunter. Bobbi tells the chief that she is part of an alien task force and that there is an alien invasion coming. And true to form, Daisy, Joey and Elena use their powers (quake, melt metal, faster as a heartbeat) to break into the police station, destroy the weapons and knock down the guards. Elena manages to shackle the paralyzer Inhuman but not before he knocks him out. Joey melts the guy’s glasses to his face (his powers come via his eyes) and Daisy knocks him out. However, as the team takes Paralyzer into custody, HYDRA arrives and takes him away. Joey tries to convince Elena to join SHIELD but she wants to do good in Colombia. While Daisy wants to build her team of Inhumans at SHIELD, she doesn’t think they all have to be based in one location. So Mack gives her a watch so Elena can call SHIELD for backup. Elena apologizes for kidnapping Mack in English and they say farewell and he calls her YoYo. Daisy offers the same to Joey and he goes home. Daisy wonders Lincold will want to go home too but he stays and they kiss. Speaking of Lincoln, he is helping Simmons better under the biology of Inhumans. Also on the Simmons front, there seems to be a chasm between her and Fitz since he returned from Maveth and killed “Will”. Fitz still feels guilty about that but Simmons thinks he was right to kill the monster that took his body. Simmons misses Fitz and wants to start over so the two re-introduce themselves and their friendship and hopefully romance will get back on track. While all that is happening in Colombia, Coulson agrees to a meeting with the President and sets it in Rosalind’s house. The President wants Coulson and SHIELD’s help with the Inhumans but still won’t reinstate SHIELD. The President tells Coulson that the ATCU will still be the face of the alien initiative but the soon to be named head will take orders from Coulson. When Coulson wants some dirt on Malick, the President says there is no point going after him as he is untouchable plus he wasn’t around him enough to know anything about him. This gives Coulson an idea to probe the mind of Werner Strucker. Using the same mind machine that Coulson was subjected to, Strucker at first only is reliving the moment where Malick’s man repeatedly stabbed him. Thanks to electroshock from Lincoln, Strucker remembers how he first contacted Malick. Using the intel, Coulson goes to the place where we can contact Malick. After giving the right code, Coulson is lead to a room with a phone that connects to Malick. Once on the phone, Coulson threatens him and tells Malick he is tracing the call. Malick is not phased and says he will close some offices where he can be traced. Malick also tells Coulson that it will take more to get one up on him. Once back on the base, we Coulson has new hand courtesy of Fitz that looks real. May and Coulson talk about his time on Maveth and also about Malick. We see a news report of one of Malick’s companies, being shut down. 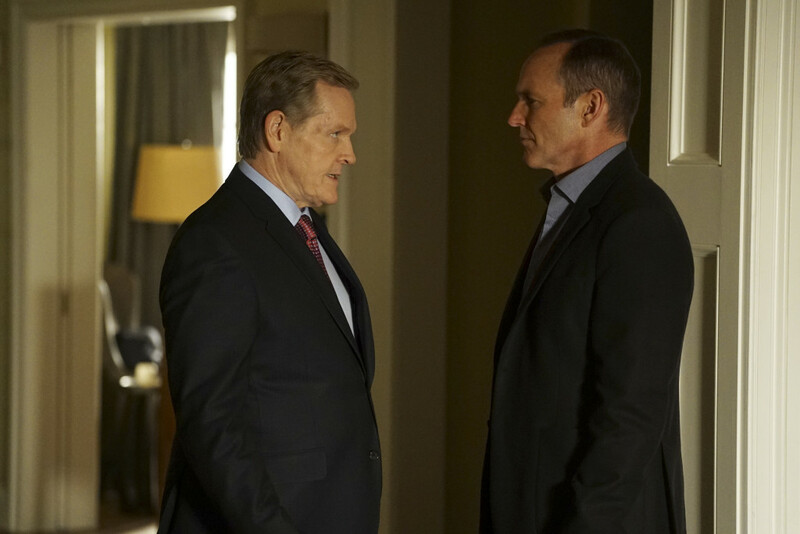 May tells Coulson that he has wounded Malick. Let’s not forget about Hive Ward, who is looking really emaciated. Hive Ward tells Malick that he is hungry. While eating his meal, he tells Malick and Giyera how humans haven’t changed. Hive Malick also notes that Giyera is skeptical about him but will prove who he is once he is better. Malick is also skpetical and we then see Hive Ward start to use his powers. In the Coda, we see that the President has named General Talbot as the new head of the ATCU news that doesn’t thrill Coulson.